Steven Universe meeting White Diamond. Steven Universe has always given its villains sprawling narrative arcs about redemption that culminate with them coming to love Steven and deciding to become his allies. In most cases, that transition is verbalized over multiple episodes, but the show handles things quite a bit differently in “Legs From Here to Homeworld,” a brand-new episode Cartoon Network dropped on its app last night. After Yellow and Blue Diamond finally realized that Steven was, in fact, a transformed Pink Diamond at the end of “The Heart of the Crystal Gems” Stevenbomb, there was little doubt that they’d be overjoyed at being reunited with their long lost...sister? Every since Steven Universe first began to show us glimpses of what kind of person Pink Diamond was before transforming into Rose Quartz, there was always a sense that both Blue and Yellow had a distinctly maternal relationship with her. When “Legs From Here to Homeworld” opens, that vibe is definitely still there, as Blue, crying tears of joy that all of the Gems have to feel because of her empathic powers, smooshes Steven to her face and Yellow frostily inquires about why “Pink” looks and sounds like a human boy. Even though the Crystal Gems aren’t exactly comfortable being in the presence of the Diamonds, they can’t deny that they have a genuine love and affection for Steven (even though they don’t quite get that he isn’t exactly Pink). What’s clever is that almost instantly, Steven Universe visually signifies their shift from villain to ally by framing them more straight on and from above as opposed to below. 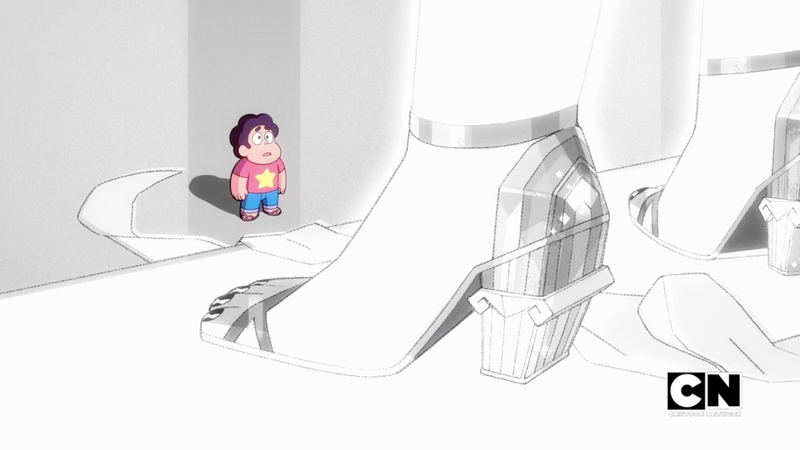 While the Diamonds never actually become smaller, there are a number of scenes all throughout “Legs From Here to Homeworld” that put them in a perspective that makes them seem less like larger-than-life, godlike figures, and more like regular gems that just happen to be a bit larger than normal. In using shots in which you can see their whole bodies, and where they’re juxtaposed with other large objects like trees, the episode makes them feel more human—and even though there are moments where it’s impossible to ignore that they still dwarf the other gems, they no longer feel quite like terrifying monsters. What really solidifies Blue and Yellow’s shift, though, is the introduction of White Diamond (voiced by Christine Ebersole), the fourth and most powerful of the Gem matriarchs. As Steven, Connie, the Crystal Gems, Yellow, and Blue make their way to Homeworld in Pink’s decidedly thick legs ship, all of the gems become honest and candid about White in a way that reveals things about themselves. Though she’s never explicitly told to do so, Pearl really shifts back into her role as a Pearl by navigating the ship after initially guiding Steven how to get it to launch. Pink Diamond’s ship never skips leg day. Both Blue and Yellow speak about White with a reverence that’s shot through with fear. It becomes clear that—despite all the time Steven Universe spent making them out to be the biggest bads Steven and the Gems might ever face—they were legitimately just people upset by the loss of their sister, while knowing that the mother they feared was on Homeworld simply waiting for them to come back. The group’s return to Homeworld is sudden and feels somewhat rushed, but the rushed-ness seems purposeful and reflective of the reality that Homeworld society truly is different in a way that Steven doesn’t understand. Efficiency, precision, and regiment are the things that define Homeworld—a strict adherence to rules that keeps everyone in their place. Though Yellow and Blue want to head off whatever fury White may have at learning the truth about what happened to Pink, White Pearl (who, interestingly, is also voiced by Christine Ebersole) informs them that White Diamond is only interested in speaking with the holder of Pink Diamond’s gem. White Pearl’s seeming lack of emotion and the brutal scarring on her physical form are subtle, chilling hints about the kind of monster that White Diamond is likely going to be revealed to be. 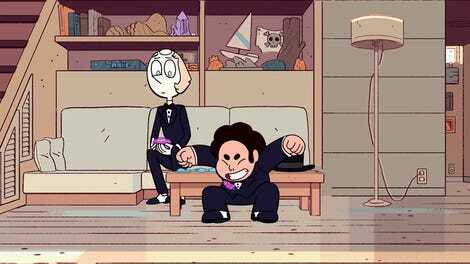 When Steven comes face to face with White Diamond, he’s at a loss as to how to approach her. Despite Steven’s attempts at introducing and explaining himself to White, she’s dismissive of him in a way that’s truly chilling. White, in that moment, isn’t exactly being a terrifying villain, but rather a person on autopilot who comes across as being detached from the conversation in an effort to pretend that everything is okay . Her pleasant, businesslike demeanor is in sharp contrast to the things the other Gems have hinted about her—but at the same time, all of her grandeur and radiance can’t quite erase the memory of her clearly tortured Pearl. There’s more to White Diamond than Steven Universe has revealed so far, and when the show makes its next return to television, it’s all too likely that White’s veneer of perfection and calmness will crack, and we’ll see just why the other Gems live in fear of her.